GOLD FOLIATE JEWELRY WITH MASTADON IVORY AND PEARLS; Three pieces, 20th c.: two ivory brooches with nuggets centers, one with 10k foliage; 18k and river pearl bracelet with spare link; 22.8 dwt. GW (35.5 gs. 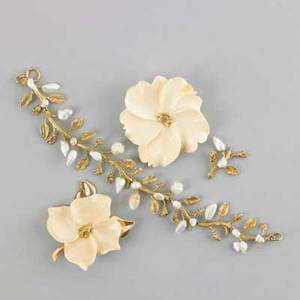 GW) (bracelet and one brooch only). Note: This lot contains ivory. International bids and bids issuing from the State of California may be subject to laws that forbid the export and/or import of materials made from certain species. It is the sole responsibility of buyers to familiarize themselves with these laws prior to bidding and to abide by these laws. See Terms of Sale paragraph #24.